If the Weather Mistress is right, we may have a repeat of last December’s weather. It is twenty degrees outside and Gretchen tells me to expect several days of freezing rain and snow. Just what I needed, of course. This delays further the replacement of our damaged roof. We still have black plastic covering the many holes created by hurricane Isabel. We have been anxiously waiting these last months for our roofing contractor to complete his backlog and begin work on our house. We had hoped to replace the roof and kitchen ceiling before snow fell. Looks like we may have to work between storms. Should be interesting, to say the least. 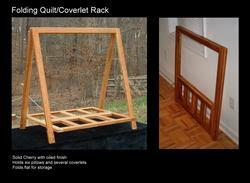 Meanwhile, back in the shop, I have been constructing prototypes of a new product, a folding quilt/coverlet rack. The first one went out last night and I am eager to hear the reviews. This is an original design in oiled cherry and it will be on my commercial website as soon as we take pictures of it. I was also hoping to get a shed constructed before snow fell so I would have space outside the workshop for finishing products. That construction was dependent on the arrival of 30 cubic yards of fill dirt. I have roped off an area where the fill dirt will extend our back yard hillside enough to provide a broad pad for the new shed. Earlier this year, contractors couldn’t find enough places to get rid of fill dirt and were giving it away. But more recently, wet weather has made it impossible to deliver and compact what we needed. A friend has just shown up to work with me in the shop. UPDATE: It’s still freezing outside, but we made some progress in the shop at least. Here is a preview of our next product. When you get the picture posted, may I please have the URL to your commercial site? I quilt, and I’d love to see what your quilt rack looks like. Me, too! (I don’t quilt, but my sister does, and I would like to peek at your commercial site.) Oiled cherry wood just sounds beautiful.